Our newest Hot List is Human Interfaces. This is anything you’ve designed into your project to interact with people. And we want to see it all! Do you have something bristling with buttons, boasting many LCD screens, hosting controls organized with the principles of Feng Shui, or intuitively voice activated? Show us the user interface you’re proud of and you could win one of thirty $100 gift cards for Ponoko laser cutting service. Good luck, and per usually we’d like to encourage you to Vote this week. It’s a great way to explore the entries in this year’s 2015 Hackaday Prize, and you just might win $1000 from the Hackaday Store just for voting! While others are absorbed in baseball playoffs, [Aidan] has spent his recent Octobers planning incredible Halloween costumes for his son. We don’t know what he did last year, but there’s no way it’s better than this laser-cut cardboard airplane costume. He had a few specs in mind and started with a model of a Grumman F4F-4 Wildcat from 3D Warehouse. Using SketchUp, he simplified the model and removed the landing gear and the propeller. [Aidan] created a simpler model on top of that, and set to work changing the proportions to make it adorable and toddler-sized. To build around his son’s proportions, he inserted a 10-inch diameter scaled tube vertically into the model and squished down the fuselage in SketchUp. The plan was to have it laser-cut by Ponoko, which meant turning the design into flat pieces for them to cut. He ended up with 58 parts, many of them mirror images due to the symmetry of his design. When the box from Ponoko arrived, [Aidan] was giddy. He was astonished at the quality of the pieces and found the plane very satisfying to build. But, he didn’t stop there. Using LayOut, he created a custom instrument cluster with reflections and shadows. The plane also has a Wii steering wheel, a motorized propeller, and of course, decals. [Nathan]’s son really loves numbers and counting, and one of his favorite things to do is add 1 to a calculator over and over again. Being the awesome dad that he is, [Nathan] built his son a counting box that has a 10-digit rotary switch and two arcade buttons to add and subtract. One goal of the project was to have the counting box retain memory of the display while being powered off. The easiest way to do this is to write the display data to the ATmega’s EEPROM. This EEPROM is only rated for 100,000 write cycles (although in practice it’s much higher), so [Nathan] included a 24LC256 in a little spasm of over-engineering. All the electronics are laid out on perf board, and the case is constructed from bamboo that was laser cut by Ponoko. The quality of the case itself is fairly remarkable – we’re really impressed with the finish and the magnetic battery access door. From experience, we know that playing with an HP-15C eventually leads to a broken calculator and having our Nintendo taken away. We’re really happy for [Nathan]’s son, and wish we had our own counting box at his age. Google’s Maker Faire exhibit space is swarmed with robots…er, androids. 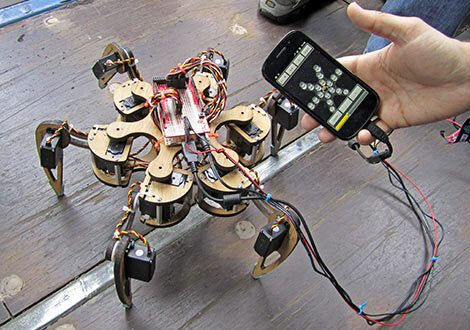 Amidst some cool bipeds and Segway-balancers, our inner sci-fi nerd was most smitten with this hexapod design, which they’ve dubbed SKPR Bot. The “Skipper” is on hand to showcase the ease of various Google technologies: SketchUp, Android OS and the Android Open Accessory Development Kit. The whole project came together in less than six weeks. 18 servos are mounted to a framework designed in SketchUp and laser-cut by Ponoko. The low-level servo PWM control is handled by the Dev Kit (essentially a rebadged Arduino Mega, as we’ve seen), while an Android OS phone provides a slick GUI and handles all the inverse kinematics calculations required as the robot takes each step. The coolest bit is that it’s all up for grabs. At this moment you’ll have to scrounge around the ’net a bit to find the plans and code, but some time post-Faire they plan to bring everything together at the SKPR Bot site. 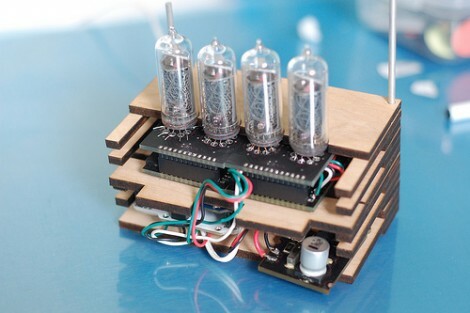 This set of four Nixie tubes display the number of people following bildr on Twitter. That’s neat; it uses an Arduino and some open source driver boards. But what caught out eye is the enclosure. The image above shows only half, but when assembled it’s a nice little cube that keeps the insides safe. This was laser cut using the Ponoko service and kicks off a design contest. Come up with the best idea for using 4 Nixies, their drivers, and $50 worth of Ponoko’s services and they’ll give you the materials to make it happen. 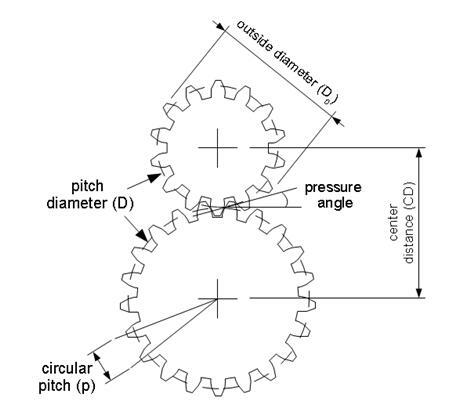 [Dustyn Roberts] takes us through the process of designing gears for a specific application. Using Inkscape and Ponoko.com [Dustyn] takes us from equation to physical gear. While there is a plugin for Inkscape that allows you to basically drag and drop gears, this writeup will take you through the math to get exactly what you need. Those laser cut wooden gears are pretty cool looking too.